Ole Miss Mom: Too Much Family??????? So 'tis the season to start planning all the family get togethers for Christmas and Thanksgiving! I know that for me it can start to make my head hurt just by having to think so hard on how we're going to please everyone! It's hard! So my mom and I were talking last night on all the little details of who's going to be where on Christmas and Thanksgiving. We have to work around my sister and her husband. And they have to go see his family too. 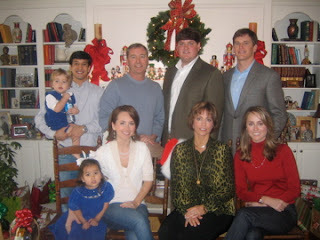 We have to travel to Jackson, MS to see Robert's family for Christmas and then fit my family in too. Which is harder than it sounds - considering Christmas falls on a Tuesday this year and Robert has to work Christmas Eve (I know, don't get me started!). Throw in 3 kiddos and it gets CRAZY!!!! So in the midst of still not knowing what days we're going to do what for Christmas, my mom said, "It's so hard to plan everything because we are BLESSED with so much FAMILY!!!" AMEN! Even though it seems like such a headache to try and make it everywhere, it really shouldn't be thought of as a dilemma!! We have so much family that wants to spend time with us and see us!! How awesome! So, if you're anything like us and trying to go so many places over the holidays - feel BLESSED by so many people that wants to spend time with you! Feel the love - and then pass some on! i read this blog to dad......he said " i claim her ,she's mine ..we are kindred spirits" excuse me ...i raised her!!! !